Everyone loves the opportunity to catch up and reminisce over a cup of tea. So pop the kettle on and share your favourite bakes with family and friends between 1st and 8th March, and raise funds for Dementia UK’s specialist Admiral Nurses, to help families facing dementia. 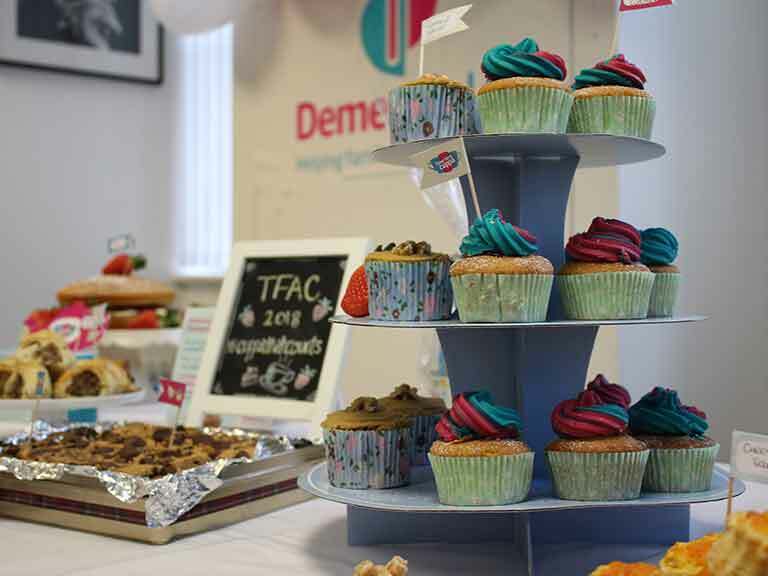 Dementia UK is celebrating 10 years of fundraising tea parties. Time for a Cuppa runs from 1st-8th March every year, when people like you host a tea party to raise funds for Admiral Nurses. It’s a lovely opportunity for people all over the country to spend time with friends and family, have a natter and catch up over a cuppa and a piece of cake. No matter what size, every tea party makes a difference to the lives of families facing dementia. Families with an Admiral Nurse have someone knowledgeable and compassionate by their side – and we want every family who needs an Admiral Nurse to have access to one. By making Time for a Cuppa you will help to provide more Admiral Nurses for families affected by dementia. When things get challenging or difficult, Dementia UK’s Admiral Nurses work alongside people with dementia, and their families: giving them one-to-one support, expert guidance and practical solutions. The unique dementia expertise and experience an Admiral Nurse brings is a lifeline–it helps families to live more positively with dementia in the present, and to face the challenges of tomorrow with more confidence and less fear. Most Admiral Nurses work in the community for the NHS, and others work in care homes, hospitals and hospices, or on the Admiral Nurse Dementia Helpline. Admiral Nurses work with people and families affected by all types of dementia, including Alzheimer’s disease, vascular dementia, frontotemporal dementia and dementia with Lewy bodies. Why Admiral? The family of Joseph Levy CBE BEM – who founded Dementia UK – named the nurses. Joseph had vascular dementia and was known affectionately as ‘Admiral Joe’ because of his love of sailing. Admiral Nurses are on hand seven days a week, to speak to anyone with a concern or query about dementia, on our free Helpline. The Admiral Nurse Dementia Helpline is for anyone with a question or concern about dementia. From first symptoms , personality changes and methods for better communication, through to strategies for helping someone with dementia be calm and comfortable, our specialist Admiral Nurses have the knowledge and experience to understand the situation and suggest answers that might be hard to find elsewhere. Call our Dementia Helpline for free on 0800 888 6678 or send an email to helpline@dementiauk.org. Why make Time for a Cuppa? This year, we are celebrating 10 years of fun, family tea parties for Dementia UK. Helen Fowler has taken part every year since it began in 2009, and will be taking part for the tenth time this March. Helen says, “There’s no denying that a diagnosis of dementia can make people feel scared and alone. That’s why it’s so important to bring people together, to talk about experiences and to encourage more support for this life-changing condition. I can think of no better way to do this than Dementia UK’s annual Time for a Cuppa party which I have taken part in every year since it started back in 2009. Dementia affects every family differently but with Time for a Cuppa families are brought together to raise awareness and funds for more desperately needed specialist dementia nurses (Admiral Nurses). My dear husband, Tony, was diagnosed with vascular dementia and I don’t think I would have coped without their invaluable practical and emotional support. I remember being put in touch with my Admiral Nurse, Helen Springthorpe, all those years ago by my local doctor. Helen ran a support group for people going through similar challenges and it had such a strong following – even our local MP came! It was this sense of bringing people together which encouraged me to have a go at hosting my very own Time for a Cuppa party. The first Time for a Cuppa party I hosted back in 2009 was in my house with a good friend of mine. It was an afternoon tea and we had a lot of generous donations. We didn’t go to town with the venue but I can honestly say it worked. There have been so many memorable Time for a Cuppa moments for me. There was an Alice in Wonderland themed party one year where everyone pulled out all the stops for their outfits! One time I even headed out to town with a couple of friends, complete with Dementia UK billboards, and we became the town criers for a Time for a Cuppa event in the town hall. Everyone was mucking in and that’s the true spirit of the event. The great thing about Time for a Cuppa is the range of beverages and cakes on offer. Lemon drizzle is a personal favourite of mine and it’s always fun when people bring their homemade goods. It’s a true labour of love. If hosting your own tea party may seem like a bit of a challenge, I can honestly say that you don’t have to worry about it all as the Dementia UK team is so incredibly supportive. It’s the icing on the cake. Baking and making food can be soothing for someone with dementia. The smells and tactile experience can be calming and, for some people, evocative of their childhood. You can help to make things run smoothly by weighing out ingredients beforehand, and having them laid out upon a kitchen table. What’s more evocative than the smell or taste of a favourite childhood recipe? Those memories of baking with mum come rushing back. Spending time in the kitchen together is a great way to catch up and talk. It can be an emotive and tactile experience, which is why baking with someone living with dementia can be such a lovely and rewarding thing to do. Family time is about laughing, crying and reminiscing – and through the good times and the bad these precious moments often take place over a cuppa and a piece of cake. Why not involve your relative who is living with dementia in a Time for a Cuppa tea party. We’re inviting everyone to get together with their friends and families and hold a tea party to raise the funds that will help us reach our target of providing 300 Admiral Nurses by 2020. Time for a Cuppa is a chance to make your favourite family recipes and to remember and cherish the people that passed those recipes down to you. It’s also an opportunity to create new memories that you’ll treasure just as fondly. Dave, who has been an Admiral Nurse for over 20 years, has put together some advice about baking with someone living with dementia, and what a rewarding and inclusive experience it can be. Read Dave’s advice here. If you can’t hold your tea party during Time for a Cuppa week don’t worry, you can hold your tea party at any time.